Built to the demanding standards of Gretsch quality and sound, Silver Series drums offer great options as a second snare drum or as an entry point into Gretsch snare drums. 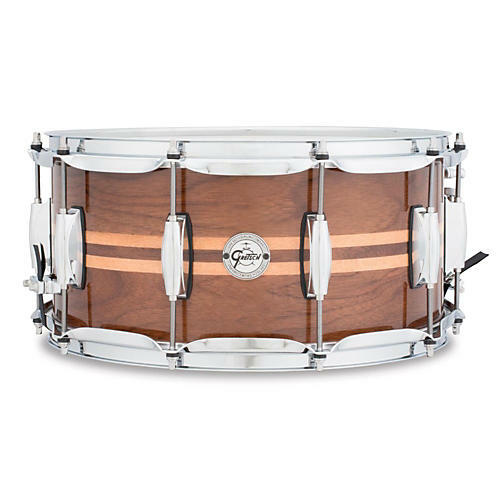 This Gretsch Silver Series Walnut Snare offers glossy wood grain with a beautiful maple inlay. The 8-ply walnut shell produces a smooth, dark tone with a medium attack, while a 30-degree bearing edge ensures that "great Gretsch sound." Available in a 14 x 5" or 14 x 6-1/2", this snare is fitted with 2.3mm triple-flanged hoops, a bolt-on Silver Series round badge and Remo USA Ambassador heads.